Waking at 4:30 AM has its advantages. 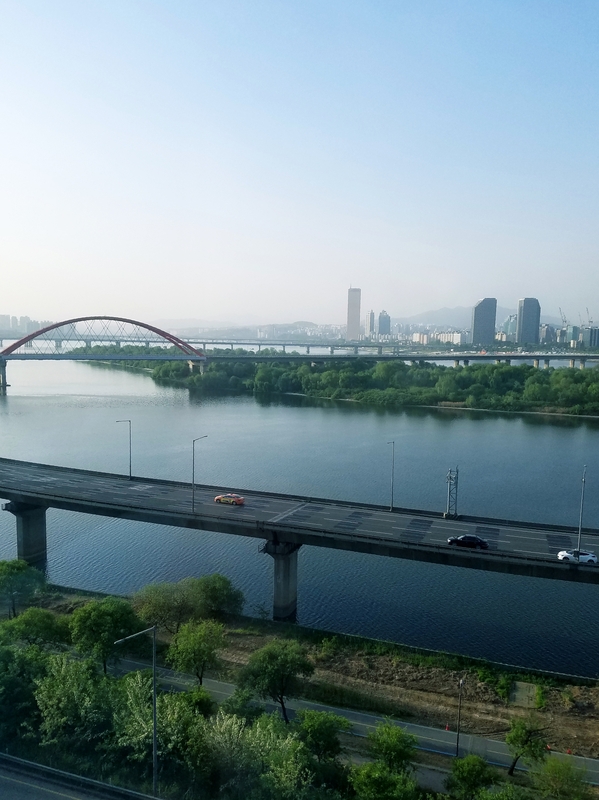 The view from our wall of window is amazing: the wide Han River splitting around a green wooded island, spanned by one red bridge nearby and several others in the distance, the skyscrapers circling the skyline, the misty mountains rising beyond them. We watch the day come in over Seoul and drink coffee and discuss our plans, and it is perfect. Later that morning we walk the streets of Insadong. It is a tourist trap, but a fun one. For a while everything is lovely: the weather cool with soft breezes, the tiny shops colorful crowding along the streets, the narrow alleys alluring curving away, the passersby Asian-faced and exotic, and the scents tangy, unfamiliar, ranging from delicious to nauseating. In one of the tiny alleys we lunch on pork belly and rice vegetable wraps with the accompanying innumerable side dishes, and I learn that kimchi in a tiny dish from a little back-alley restaurant in Seoul is almost an entirely different thing from kimchi out of a jar purchased in an American store. Later, the jet lag kicks in and the spring goes out of my steps. The streets become crowded with tourists and the sun is too bright. I am glad to leave. On the way back towards our rented apartment, I think the floor of the subway station is rising and falling under my feet. We stop at a three-level E-Mart for groceries, and it’s not entirely strange. A supermarket is a supermarket, after all, even when you can’t read the labels and signs. Smiling salesladies offer us free samples of the food, and when the husband gets a box of cereal, one of the ladies accosts us, grabbing my shoulder and speaking words we can’t understand. She gives us a box of Oreos and points to a sign which we also can’t read, but we accept them. By the time we get back to the apartment, jet lag has its teeth sunk into us. Most of us sleep the rest of the afternoon away, and digging ourselves up in time to go eat supper is something akin to torture. But we have a supper engagement at Gusto Tacos near Sangsu Station, and we go. This little taco shop is owned by a man from New York City, who started it in 2010 as just a little something while he and his wife were here for IVF. Seven years later they are still here and he’s currently franchising. His pork tacos taste amazing, even in my jet-lagging stupor. It’s dark by the time we head back to our apartment, but Seoul is awake. Music spills over us from out of the thousand-and-one cafés, bars, coffee shops, and hole-in-the-wall restaurants that line the streets almost everywhere, and there are people everywhere, inside and out. They’re a late-morning, late-night kind of city, but our bodies still want to live by the clocks of another land. Some other night, maybe, our blood will dance to their tempo. Tonight we look for our beds, pausing only to admire the sparkling city lights that make up our view. It’s been a good first day. Seoul, I am delighted to make your acquaintance at last.